Rosa Urso first appears in the Painesville, Ohio, area in 1907. In America, Rosa Urso was known by her married name, Rose Milano. Rosa Urso, daughter of Salvatore Urso and Maria Sampson, was born about 1876, at Termini Imerese, Sicily. She married Nicola Milano about 1902 at Sicily. Rosa died on October 26, 1966, at Cleveland, Cuyahoga County, Ohio. Her body was interred at St. Mary Cemetery at Painesville Township, Lake County, Ohio. Rosa Urso immigrated to the United States on June 30, 1907, travelling to Painesville, Lake County, Ohio. She was travelling with her children, Giovanna and Giuseppa. 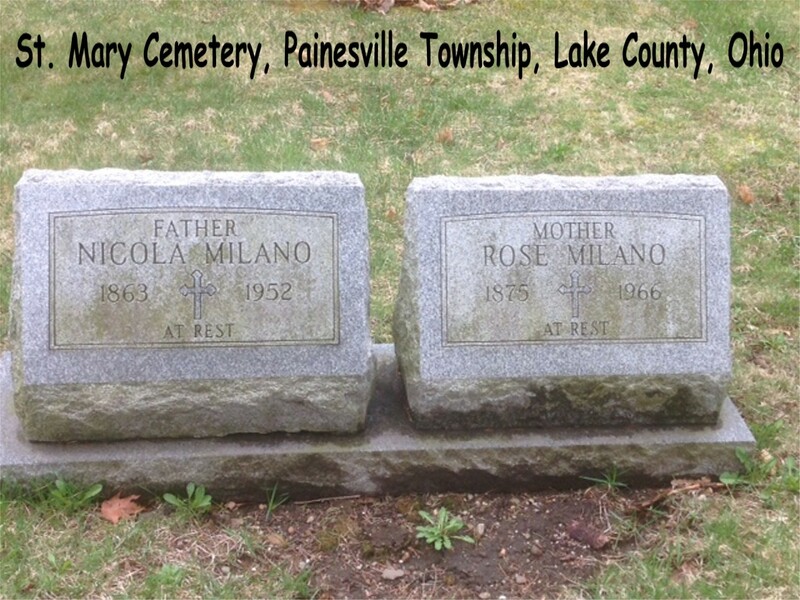 They were joining Rosa’s husband, Nicola Milano, in Painesville. Rosa’s brother, Luciano, and sister, Angela Jeffries, were already living in Painesville in 1907. 1. Giovanna Milano was born about 1903 at Termini Imerese, Sicily. She married Charles Yohn. Giovanna died on November 19, 1971. Her body was interred at Holy Cross Cemetery at Cuyahoga County, Ohio. 2. Giuseppa Milano was born about 1905 at Termini Imerese, Sicily. She married Charles Picone. Giuseppa died in February, 1969. Her body was interred at Holy Cross Cemetery at Cuyahoga County, Ohio. 3. Frank R. Milano was born on March 21, 1909, at Painesville, Lake County, Ohio. He married Claire M. Tripi. Frank died on June 17, 1985, at Lake County Memorial Hospital, Painesville, Lake County, Ohio, at age 76. His body was interred at St. Mary Cemetery at Painesville Township, Lake County, Ohio. 4. Florence Milano was born on April 4, 1912, at Ohio. She married James Pietrangelo.